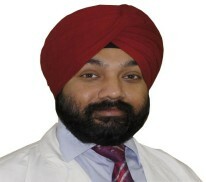 Dr. Vickramjeet Singh Dhingra, M.B.B.S, M.S (General Surgery), M.Ch (Plastic Surgery), is a Chief of Plastic Surgery Unit at Cosmo Hospital Mohali. After completing his post graduation in the field of General surgery, he opted for super specialization in Plastic surgery from the prestigious plastic surgery training centre of India, NHL Medical College, Ahmedabad, Gujarat. After that he honed his skills of cosmetic surgery in Bombay, the hub of aesthetic surgical procedures in Asia. Furthermore, he has executed advanced training in the latest technique in Hair transplant under world renowned hair transplant surgeons. Dr. Vickram’s goal for every procedure is to create the most natural looking results & restore aesthetic balance, harmony and beauty. He always strives for the health and safety of patients. To his credits, he has had experience of operating upon celebrities including singers, politicians, actors on small and big screen, and calender models. He has been participating in various cosmetic Dermatological Workshops to hone his skills further in cosmetic dermatology, incorporating in his practice the very latest techniques imbibed from all around the globe. ***My hair transplantation was done in a highly professional manner. First appointment was good and on time with no long period to get date of surgery. Nice doctor sahab. ***After investigating all the top hair surgeons, I choose Dr. Dhingra as being the most qualified and experienced doctor.. Impressed with the complete staff and nursing services. He is the best hair transplantation surgeon in tricity.